"Here's our impossibly easy pies packed with pork and Green Giant® mushrooms; made using Original Bisquick® mix  perfect for breakfast." Easy and so good! I used hot Italian sausage and didn't add salt since the other ingredients have plenty . Great to freeze for a quick breakfast on the go. Will definitely make again! This turned into a mess! 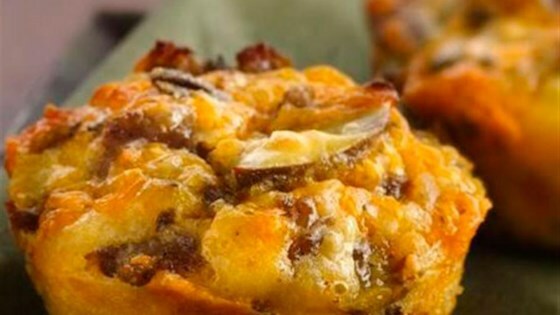 I would skip the muffin cups and put in a baking dish, but that defeats the whole point of this recipe. I whipped this up one morning for a work function. Everyone loved them. Super easy! Great and easy recipe. Just don't use muffin liners without greasing them first. I lined the muffin pans with baking cups and they came out so much easier. Just make sure to use paper cups not aluminum ones so you can microwave them in the morning. Very good! Great & easy! 1 yr old and 3 yr old loved it! Did turkey sausage & cheddar cheese only, was delicious! And great for on the go.